Now that Stephen Totilo has painstakingly researched the best way to control Temple Run 2 (now available on Android), it's time to get down to business. You know how to jump, dodge and slide, but do you know how to truly excel? The fine folks at Imangi Studios have shared three tips for racking up a score you'll be proud to see on the leaderboards. -Multiply and Conquer: The easiest way to get a larger score (so you can brag to everyone you know) is to utilize your score multiplier. To do this, you need to complete different objectives. Each objective ups your multiplier by one, so focus on those objectives first to get your score really high. It may seem counterproductive to spend 1,000 meters of your run avoiding coins entirely, but in the end the payoff is worth it. 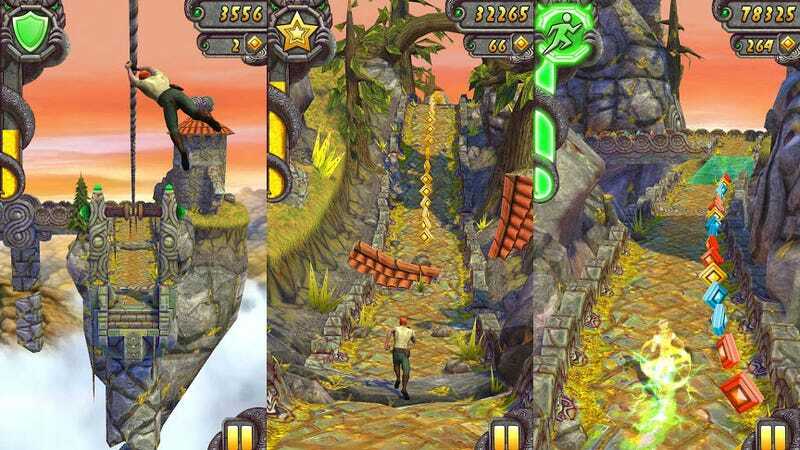 -Coins, Coins, Coins: Coins are the currency in Temple Run and they are used to upgrade the characters and gameplay. The fastest way to start earning coins is to upgrade the "Coin Values" under abilities. Doing this will make the double and triple coins appear on the track. Also, everyone's favorite powerup is the magnet- it helps you get every coin near you as you run. Not only that, those "Coin Value" powerups add a splash of color to the game once they kick in. So pretty. -Going the Distance: Clearly, you want to run as far as you can. To do that, it sometimes means you must sacrifice extra coins for bonus items. The shield power will help with obstacles, but remember, it won't protect you from falling. The Boost, at the beginning of the game, can also help you move forwards faster. Makes sense, though as a coin hoarder the idea of skipping coins in favor of a temporary special power makes me twitch. Wise words from the Imangi folks. Take them to heart, and you'll be unlocking those additional characters and maxing out your upgrades in no time flat.